Here in one compact volume is a personal medical reference guide you can turn to with trust. 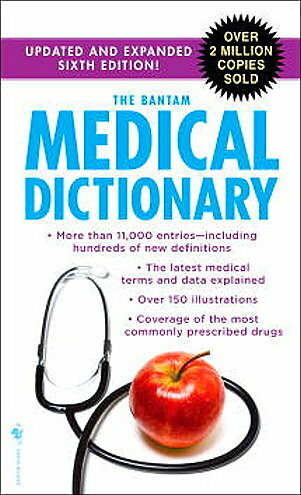 The fully expanded and revised sixth edition of The Bantam Medical Dictionary provides the most up-to-date medical information in an easy-to-access format specifically designed for general readers, students, and health-care professionals. Compiled and reviewed by a distinguished team of more than forty doctors and experts, this essential reference covers the entire domain of the health sciences, defining more than 11,000 medical terms and concepts in all the major medical and surgical specialties. You’ll find commonly prescribed drugs described, along with their generic and brand names, as well as definitions of frequently used medical abbreviations and acronyms. Comprehensive and clearly written, this is the only medical dictionary you’ll ever need.